A growing number of educators are setting up a blog to have an online space that complements their physical space. In our last survey on The State of Educational Blogging, around one third of our respondents told us that the type of blog they used was a class blog. Class blogs are very popular and why wouldn’t they be when you consider the huge benefits for students, teachers, and the school community? Because we know many of our readers love seeing examples, we have put together a showcase of ten great blogs powered by Edublogs, CampusPress, or WordPress. 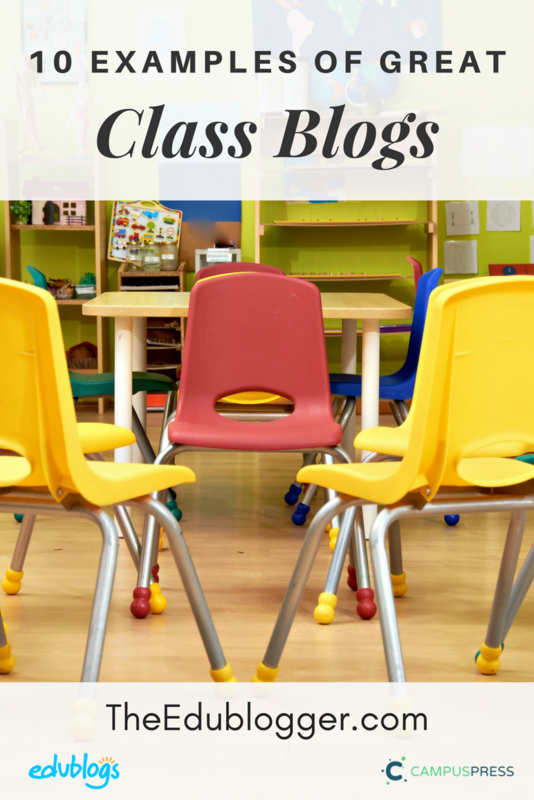 These class blogs are just a tiny fraction of the high quality spaces out there. We strongly encourage you to leave a comment on this post with your contributions! We have selected a range of different age groups and subject areas to demonstrate what’s possible. Becky Versteeg is a Grade Two teacher from Ontario, Canada. Her class blog is an online hub which showcases student work and events, while keeping families up to date with everything that is happening in class. You’ll also find links to all her student blogs on the right sidebar. This is such an impressive set up for a class of 6 and 7 year olds! Mrs Kriese’s 7th Grade ELA (English Language Arts) class blog is such a rich student-centered space. Student learning and reflections are showcased both on class blog posts and through individual student blogs (links are on the left sidebar). It’s clear that blogging is integrated well in this Texas classroom. Norway educator, Ann Michaelsen operates this blog in a very unique style. Connected Teaching And Learning is Ann’s professional blog where she publishes regular reflections on what she is reading and learning. Beyond that, it is also a classroom hub for lesson plans and materials, as well as a home for many student blogs (links are on the right sidebar). Ann shares a great overview of the benefits of blogging for her high school students in this post from 2016. Ann’s approach makes us wonder if it would be beneficial for more educators to set up one blogging hub for the many aspects of their professional lives. What are the pros and cons of this approach? Leave a comment and tell us what you think. Mr Benoit’s use of humor and image rich posts would no doubt resonate well with his young Texan students. This blog is updated very regularly which makes it particularly useful to families wanting to keep up with what’s happening in class. There are student contributions too, and families are invited to send in photos from holidays and adventures outside of the classroom. This looks like a fun community to be a part of! Have you ever thought about recording your lessons and publishing them, not just for your own class, but for anyone who wants to watch and learn? Eddie Woo is a Sydney maths teacher who has done just that. Eddie’s award winning work has earned him a huge following with students from across the world. Eddie uses a WordPress site as an online hub for a blog, his YouTube channels, learning resources, and more. This is a great example of how blogs have evolved to be dynamic homes for any online creations. Ian Rockey is head teacher at a UK primary school that is small in size but big on connecting the community in innovative ways. Links to each of Westwood’s four class blogs can be found on a central landing page. This example demonstrates the benefit of connecting individual class blogs across the school. One outstanding feature of this school’s online presence is their own radio station which is organized and run by the children. Check out their incredible work! Kevin Hogson is a long time blogger who maintains both a professional blog and a class blog for his sixth grade writing workshop students. On his professional blog, Kevin often publishes more detailed posts about lessons, while exploring various other topics. Kevin shares many creative ideas and his blogs are well worth a look. One subject area that has been totally transformed by technology is language learning. What a joy to be able to hear, see, and connect with other language learners or speakers. Grade Three French Immersion Teachers, Mme Harrison and Mlle Nicholson use their class blog to introduce the students to French resources, as well as sharing student learning. One particularly interesting idea they use is a ‘Thought Box’ page where parents are invited to share thoughts that won’t be published. A blog is the perfect complement to a photography class. After all, what’s the point of working on all those images if no one sees them? Teacher, Rebecca Cauchon showcases her students’ truly amazing creations on the Jurupa Hills High School Photography blog. This is done through posts on the class blog and individual student blogs (see the links on the sidebar on the right hand side). This blog really is a visual delight! Our final example is from a class of very young students. Paula Crockett and Aviva Dunsiger are an innovative pair of Canadian teachers who use a class blog to connect with families. This blog is a real hive of activity and their Daily Shoot idea is a marvelous way to keep families up to date. This concept has replaced a traditional class newsletter. Aviva is also a well known blogger herself. Her professional posts often expand and reflect on the content of the class blog posts. Confused about the platforms these blogs are built with? Let’s break it down. You’ve probably heard of WordPress? It’s the most popular content management system out there. In fact, more than a quarter of websites worldwide are built with WordPress. Some educators build their blogs straight from WordPress.com or WordPress.org. Edublogs is a popular option for those who are interested in using a WordPress platform but want the technical side of things taken care of including hosting and backups. Edublogs also offers a blogging platform that’s purely for education with the added elements of support and safety. CampusPress is a WordPress platform for a whole school, university, district, or other educational institution. It offers the same great features that come with Edublogs, plus more, including individual branding. So why is a WordPress platform like Edublogs the way to go? The fact that it’s export friendly is a big reason. You want to be able to take your work, or your students’ work with you. Of course safety is a huge decider for many schools too and we have that covered. Many teachers really appreciate being able to have personalized support to help them through their blogging journey. Students and educators love being able to customize their online space, just like they do in their offline spaces. Themes, plugins, and other extensions allow you to do just that. It’s a great idea to consider the future of your blogging platform too. With WordPress powering so much of the web now, who knows where your students’ blogging skills could take them in the future! Want To Start Blogging But Not Sure How? We have a new post just for beginner bloggers. It includes a 15 minute tutorial video and all the help guides you’ll need to get going! 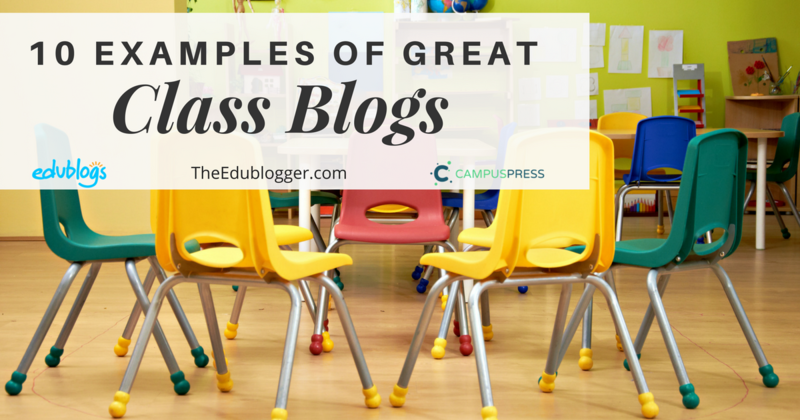 Do you know any great class blogs? Perhaps you have a class blog of your own? I started a class blog last fall with my third grade students having a goal in mind of participating in the spring Blogging Challenge. I use my class blog for displaying student work, technology integration, publishing writing, teaching digital citizenship, and evaluating students in their writing. I will be presenting a classroom blogging session at a conference next week, which will include standards connections and blog setup for educators. One of my favorite things to do is go back to the beginning of year blog posts written by my students and show them how much they have grown over the course of the school year! My class especially enjoyed checking out other class blogs and interacting with students across the globe in the March Blogging Challenge. Thank you for providing such a great platform for me to use in my school and classroom! I love the work you’re doing on your blog! If you haven’t already you might like to check out Mrs. Yollis’ class blog as she is also in 3rd grade and her students have their own blogs with Edublogs. I used to love doing the same thing as you with comparing students work. You can often see such a dramatic difference! So glad you’re enjoying the challenge too. Let me know if there’s anything in particular you’d like me to showcase or perhaps some of your third graders would like to write a ‘how-to’ for challenge participants sometime, like Lauren did a few weeks back. Something to think about! Nice article,Thanks for posting this type of information in this article. Let them know what the problem is and they’ll be more than happy to get you sorted! I keep a blog about Arts Integration, mostly music. I update regularly, and have great original content including pictures, video, free lesson plans, and more. I’m about to embark on my most ambitious project yet, the Arts as a Path to Global Citizenship, which I will be conducting as an Action Research Project, gathering data and evidence of its impact along the way. As part of my graduate program, I plan on using my blog to update progress along the way. If you’re interested in music, the arts, or just innovative teaching practice I encourage you to take a look! Thanks so much for sharing your blog. So much great info there. I’ll be sure to share your work on the Edublogs Twitter account too so others can take a look. Are you on Twitter? Alright! I’ve joined and am using Twitter to live tweet the progress of my new 10 week elective / action research project. I’ll add you and take a look if the idea of “The Arts as a Path to Global Citizenship” interests you! Thank you so much for the kind words and mention in this post! I can’t wait to check out the other blogs here.